The installation instructions provide the exact location for installing the fifth wheel trailer hitch for optimum towing. With an 8-foot-wide fifth wheel trailer, Reese and Draw-Tite recommend a distance of 52" from the cab of the truck to the center of the fifth wheel hitch. Because the hitch must remain in front of the rear axle, long-bed full-size trucks are recommended. Any truck with a bed less than 8 feet long is considered a short bed. If a short-bed truck will be used, it is recommended that a slider fifth-wheel hitch and an extended pin box be used to help compensate for the reduced turning clearance. Without the slider or pin box extension, the trailer can strike the cab on sharp turns. The Slider allows the vehicle to make normal turns during low-speed maneuvering. 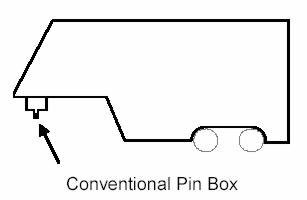 The extended pin box (minimum 13") creates even more space between the truck cab and the trailer. 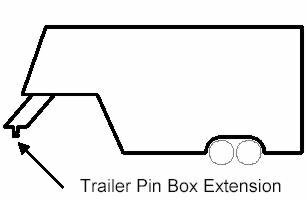 When you are towing a fifth wheel trailer on the highway, the trailer king pin must be between the cab of the truck and the rear axle. This makes maneuvering a trailer around a narrow campsite with a short-bed truck very difficult. The slider locks in place between the cab and the rear axle for highway towing. However, when you are maneuvering around narrow spaces, the slider can be released, moving the hitch - and therefore the king pin - 10" closer to the tailgate. The greater space between the cab and the trailer allows for greater turning clearance. 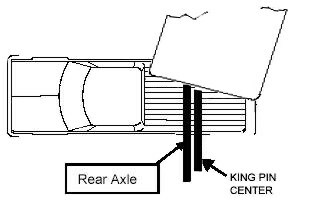 This diagram shows how sliding the hitch closer to the tailgate of the truck provides a greater distance between the cab and the trailer, optimizing turning clearance. 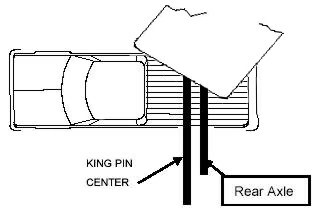 This diagram shows how turning is restricted when the hitch is located in its proper position for highway use. When bracket installation is performed properly, there is no benefit to welding the installation brackets to the frame compared with bolting the brackets. If welding is preferred, make sure it is performed by a certified welder. Universal rail kits that can mount to any full-size pickup are available. They often require drilling to install. If the vehicle is a late model Ford (1997 +), Chevrolet (1999 +), Dodge (2002 +) or GMC (1999 +), drilling can be avoided with the custom installation kits. The custom rail kits mount to existing holes in the frame, reducing installation time by up to 50 percent. The custom rail kits will also work with both long-bed and short-bed trucks. Not included with the custom installation kits are the rails that the fifth wheel hitch sits on. The custom installation kits are designed to be used with fifth wheel hitch rails part RP58058 but work with most fifth wheel rails. Fifth wheel installation rails cannot be installed over plastic bed liners. The liner will eventually disintegrate resulting in a loose hitch. However, the installation rails can be installed over a spray-in liner. Watch the removal of part of a bedliner to install a fifth-wheel hitch. Lubrication is extremely important. Before lubricating, remove the old, dirty lubricant. Use either a plastic lube plate or automotive-type chassis grease to lubricate the skid plate surface. The plastic lube plates must have a diameter of at least 10 inches and be no thicker than 3/16 of an inch. To keep moving parts in good working order, use engine oil or white lithium spray lube. For the joints inside the hitch head, use a white lithium spray. For the other moving points, use a high-pressure lube (80/90 gear lube). Also, lubricating the interior handle and the spring coils eases hitch operation. Before each use, engage the jaws to make sure they operate easily.